Having to deal with budget constraints, health care policy-makers are to plan their decisions on evidence that a new health care programme is cost-effective. However, multiple criteria must be taken into account when deciding on a new population-based screening programme. This study aimed to develop a user-friendly, practical tool to include multiple criteria when a child vision or hearing screening programme is considered or evaluated. Therefore, we explored the stages of the decision-making process, prior to cost-effectiveness analysis. Furthermore, we incorporated these stages into a web-based model to analyze the costs and benefits of child vision and hearing screening. Several steps prior to cost-effectiveness analysis were identified, namely ‘appropriateness’, ‘acceptability’ and ‘sustainability’. Based on literature review we designed several modules, each containing a set of questions to be answered by users of the web-based model. We incorporated multiple United Nations (UN) indicators and data collected by the EUSCREEN-study questionnaire. The modules were tested for various countries, differing in income group classification. 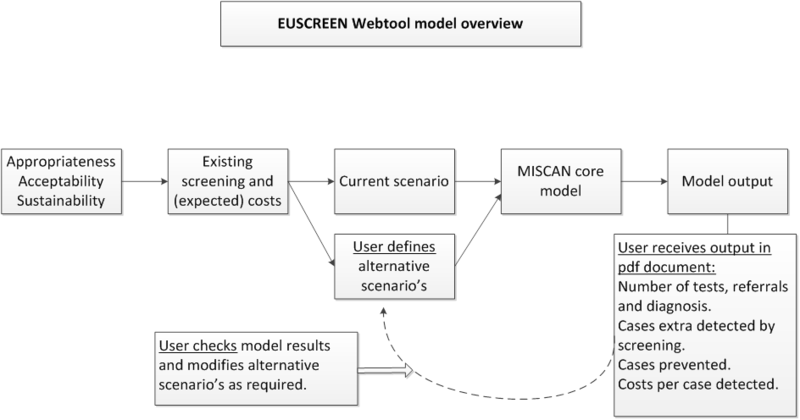 The final set of questions was included in a web-based model for child vision and hearing screening. This enables users of the web tool to assess the ‘appropriateness’, ‘acceptability’ and ‘sustainability’ of either vision or hearing screening for their country. Along with additional information on existing screening programmes and costs, the user may vary several screening protocols. All information provided is input for the a micro-simulation model (MISCAN). Final output consists of data on effects and costs of various screening strategies. This enables policy makers to make an informed decision when choosing for the most optimal screening strategy in their country. M.L. Verkleij MSc. is junior researcher at the Department of Public Health, Erasmus Medical Center. Dr. E.A.M. Heijnsdijk PhD. is assistant professor at the Department of Public Health, Erasmus Medical Center.